On November 4th (Wed., Japan Standard Time), the Japan Aerospace Exploration Agency identified that one of the main ion engines (Thruster D) aboard the Asteroid Explorer “HAYABUSA” had autonomously stopped detecting a high neutralizer voltage owing to degradation. 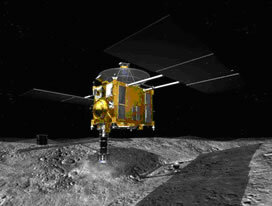 The HAYABUSA was during the second propulsion period in its return cruise back to the Earth in June 2010. Since the anomaly was identified, the project team has been trying to restart the engine while investigation of the causes; however, the engine has not been restarted yet as of today. JAXA is currently under diagnostic investigation of the ion engines system aboard the HAYABUSA and trying to build an alternative sequence that helps the HAYABUSA return back to the Earth safely. JAXA will inform you of the update as soon as available. 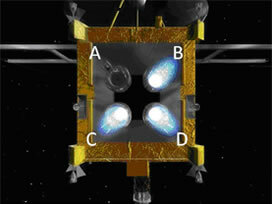 (Note) The HAYABUSA is equipped with four ion engines (Thrusters A through D,) and each thruster is in the following status. In the current plan, two thrusters, Thrusters C and D, would be used in the second propulsion period in return cruise back to the Earth. Thrusters C and D: Both of them have indicated slight high neutralizer voltage owing also to degradation. Thruster C is currently not driven, but it is operable.